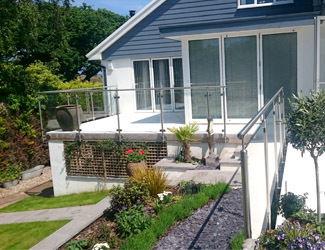 Classic Home Improvements were contracted by a client in Budleigh Salterton, near Exmouth, to install some new glass balustrades at their home. After visiting the site to take measurements, we got to work on fitting the balustrade to their patio. The glass used was double-glazed, ensuring a strong barrier that would keep everyone safe. The client was overjoyed with the results, and the balustrades provided the perfect solution to their individual requirements. At Classic Home Improvements, not only do we install balustrades for your property, we can also provide, repair and install garage doors for your home in Exmouth. With years of experience in the industry, we guarantee that you will receive a first rate service that not only ensures the safety of your possessions, but also provides a stunning look for your garage. Visit our dedicated garage doors website to find out more about how we can help you secure your garage in Exmouth.